Plastic changes to the brain due to TMS imaged for the first time. Tinnitus, migraine, epilepsy, depression, schizophrenia, Alzheimer’s; all these are examples of diseases with neurological causes, the treatment and study of which is more and more frequently being carried out by means of magnetic stimulation of the brain. However, the method’s precise mechanisms of action have not, as yet, been fully understood. Researchers from the Institut für Neuroinformatik are the first to succeed in visualising the neuronal effects of this treatment method with high-res images. The opensource study is published in the Proceedings of the National Academy of Sciences (PNAS). 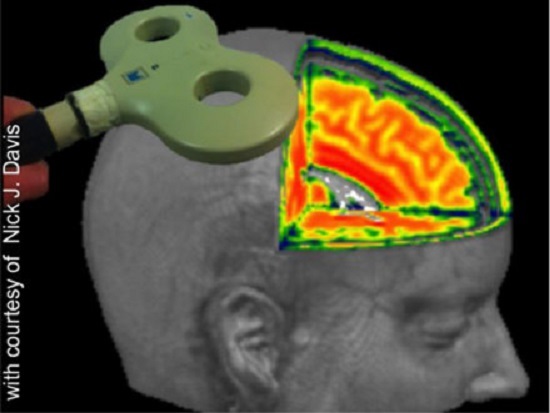 Transcranial magnetic stimulation (TMS) is a painless, non-invasive stimulation method, where an electromagnetic coil held above the head is used to generate a strong magnetic field. This method is deployed to activate or inhibit specific brain regions. Even though the number of its medical applications is constantly on the increase, TMS’ precise neuronal mechanisms of action are not, as yet, very well understood. That is because imaging used for humans, such as fMRI (functional magnetic resonance imaging), doesn’t possess the temporal resolution necessary for recording neural activities in milliseconds. More rapid measurement methods, such as EEG or MEG, on the other hand, are affected by the induced magnetic field, with the results that strong interferences are generated that cover important information regarding immediate TMS-based changes to brain activities. High-res images of TMS effects have now for the first time been successfully generated by RUB researchers in animal testing. The group utilised voltage-sensitive dyes which, anchored in cell membranes, send out fluorescent light signals once the neurons were activated or inhibited. By using light, the researchers avoided the problem of measurement of artefacts occurring due to magnetic fields. It can now be demonstrated in real time how one single TMS pulse suppresses brain activity across a considerable region, most likely through mass activation of inhibiting brain cells. With higher TMS frequencies, each additional TMS pulse generates an incremental increase in brain activity. This results in a higher cortical activation state, which opens up a time window for plastic changes. The increased neuronal excitability may be utilised to effect specific reorganisation of cell connections by means of targeted learning processes. For example, through visual training after TMS, the ability to identify image contours improves; moreover, a combination of these methods enhances contrast perception in patients with amblyopia, a disorder of sight acquired during child development. For many neurological diseases of the brain, such as epilepsy, depression and stroke, specific models have been developed. Deployed in animal testing, the current study has delivered high spatiotemporal resolution imaging data of cortical activity changes. The team are hoping that these data will enable the medical community to optimise TMS parameters and learning processes in a targeted manner, which are going to be used in future to adapt this technology for medical treatment of humans. A current-carrying coil (top left) generates short lasting (~300 microseconds) magnetic fields which induce electric currents in the cortex. This enables to functionally stimulate or inhibit specific brain regions, here illustrated in a schematic diagram by means of functional magnetic resonance imaging. Credit: Nick Davis.